Fozzie Bear is a Muppet character known for his lacking of innate and effective comedy skills. Fozzie is an orange-brown bear who often wears a brown pork pie hat and a red-and-white polka-dot necktie. The character debuted on The Muppet Show, as the show's stand-up comic, a role where he constantly employed his catchphrase, "Wocka Wocka Wocka!". Shortly after telling the joke, he was usually the target of ridicule, particularly from balcony hecklers Statler and Waldorf. Fozzie's characterization was developed by Frank Oz, who performed Fozzie until 2000. Eric Jacobson has since become the character's principal performer. Though it is often believed Fozzie's name is a play on Frank Oz (F.Oz), he was actually named after Alpha Xi Delta, the sorority in which creator Jim Henson's wife, Jane, had been a member. Fozzie Bear was originally Oz's main character. The popularity of Miss Piggy overtook Fozzie's, but he remained popular. One of his largest roles ever was in A Muppet Family Christmas, where he took all of his friends to his mother's farm for Christmas. In 1988, a video titled Hey, You're as Funny as Fozzie Bear! was released, and was intended to help kids develop comedic talent. During the 1990s, his roles became much smaller, due to the fact that Oz had turned his focus to directing non-Muppet films and reduced his time with the Muppets. Fozzie was only a supporting character in the Muppet films of that decade, and only appeared in six episodes of Muppets Tonight. However, he returned to prominence when Eric Jacobson took over beginning with It's a Very Merry Muppet Christmas Movie, in which Fozzie was the focus of a number of scenes. 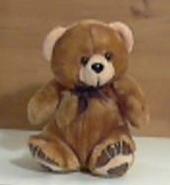 The original puppet is kept in the teddy bear museum in Stratford-upon-Avon, founded by Gyles Brandreth. Frank Oz first performed Fozzie in 1976 on The Muppet Show. He remained Fozzie's main performer until he retired from the role in 2000. In 2001, Eric Jacobson became Fozzie's new main performer, and has continued to perform the bear since then. Kevin Clash puppeteered Fozzie for much of the production of Muppet Treasure Island (with the unavailable Oz dubbing Fozzie's voice). Victor Yerrid performed Fozzie for a 2006 Disney Cruise Line stage show, Muppets Ahoy!. Voice actor Greg Berg provided Fozzie's voice for the Saturday morning cartoon Muppet Babies, as well as its short-lived spin-off, Little Muppet Monsters. The character regards Kermit the Frog as his best friend. Fozzie and Kermit have also frequently been paired together in countless movies, books, and specials. In The Muppet Movie, Fozzie is the first Muppet that Kermit meets on his journey. After Fozzie's unsuccessful comedy performance at the El Sleezo Cafe, Kermit invited Fozzie to come to Hollywood with him. The two friends sing the duet "Movin' Right Along" in the film. Several episodes show Fozzie as dedicated to Kermit, usually responding to his instructions with a chipper "Yes sir." On those rare occasions when Kermit must be away from the theater, he invariably leaves Fozzie in charge of the show, although he equally invariably regrets it. In The Great Muppet Caper, Fozzie and Kermit are portrayed as twin brothers. 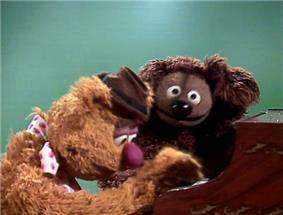 Fozzie's mother, Emily Bear (performed by Jerry Nelson), appeared in A Muppet Family Christmas special. To Fozzie's surprise, she was friends with Statler and Waldorf, despite the heckling they inflict on him. Fozzie also has a cousin who appeared in the first season of The Muppet Show, also performed by Frank Oz. In the Muppet Movie Fozzie makes reference to his uncle, whose Studebaker he traded in while his uncle was hibernating. His cousin is an audience member. In one episode of The Muppet Show he begged the other audience members not to insult his cousin Fozzie. He has a friend called Jasmine the tortoise. In the first season of The Muppet Show, the show's opening featured Fozzie telling a joke during an instrumental portion of the theme song. Fozzie was often featured in a sketch where he did a comedy monologue, in which Statler and Waldorf would heckle him (he was their favorite victim). In the second season, Fozzie's comedy routines often had gimmicks such as ventriloquism or performing on roller skates. As the series progressed, he did fewer comedy routines, becoming more involved in the show as a whole. He also performed as a magician occasionally. Occasionally, Fozzie uses Jewish humor on the show, a nod to Frank Oz's Jewish ancestry and the Borscht Belt comics that were widely popular in the mid-20th century. For example, "The Telephone Pole Bit" included a reference to Frank Oz's Polish Jewish father, and in Fozzie's magic act, he pulls a rabbi out of his hat. Though his main job was to be the show's comedian, he has had a number of other roles on The Muppet Show. He sang and danced in many musical numbers, and frequently acted in sketches (most famously his recurring sketch Bear On Patrol where he plays an unlucky police officer). He also often helps backstage and even attempts to plan out the show in one episode, and write the script in another. In one episode, he and his mother Emily do a performance of Knees Up Mother Brown, in which he sings and Emily dances as Mother Brown in the chorus. In Episode 115, Fozzie constantly annoys Kermit with a running gag, delivering a number of pun items, such as a "wire" and a "letter" for Kermit the Frog which turned out to be a clothes wire and the letter R, respectively. 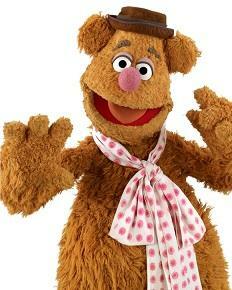 Another running gag is Fozzie's hat—as a bear, he is naturally covered with fur, all over. However, upon removing his hat, it is clear that his head shape is modeled on the pate of a bald headed man—thus, the juxtaposition of being both furred and bald simultaneously. This was referenced in the 2011 film The Muppets, where he saw an old picture of himself at the Muppet Theater and ridiculed the "'80s haircut" he sported back then. Fozzie was also frequently teamed up with Rowlf the Dog. In Episode 101, Fozzie plays a western bandit to Rowlf's role as a western hero. Fozzie also appeared in two Veterinarian's Hospital sketches, in which Rowlf starred as Dr. Bob. In Episode 218, Rowlf learns that Fozzie could play the piano, and they play the piano together in a performance of "English Country Garden". Rowlf has also played back-up to Fozzie's renditions of "Hi-Diddle-Dee-Dee (An Actor's Life for Me)" and "I've Got Rhythm". During the latter number, Rowlf attempts to help Fozzie with his singing but is finally reduced to changing the hapless bear's lyrics to "I Don't Got Rhythm." The young incarnations of Fozzie and Rowlf are also frequently paired together on Muppet Babies. In the comedy-musical, A Very Potter Senior Year, which parodies the popular film and book series Harry Potter, and stars Glee‍‍ '​‍s Darren Criss in the role of Harry Potter, Fozzie Bear is comically voted to be the new Head Boy at Hogwarts, due to a prank pulled off by the majority of the school's student body. Fozzie was featured on the #10 Valvoline Pontiac of Mike Wallace (who was filling in for the car's regular driver Johnny Benson) in the 2002 Tropicana 400 in an advertising campaign in which he and his fellow Muppets were featured on a select few race cars. Fozzie also appeared alongside his fellow Muppets in the Halloween 2011 episode of WWE Raw, where he and Gonzo encountered Jack Swagger, Dolph Ziggler and Vickie Guerrero backstage. 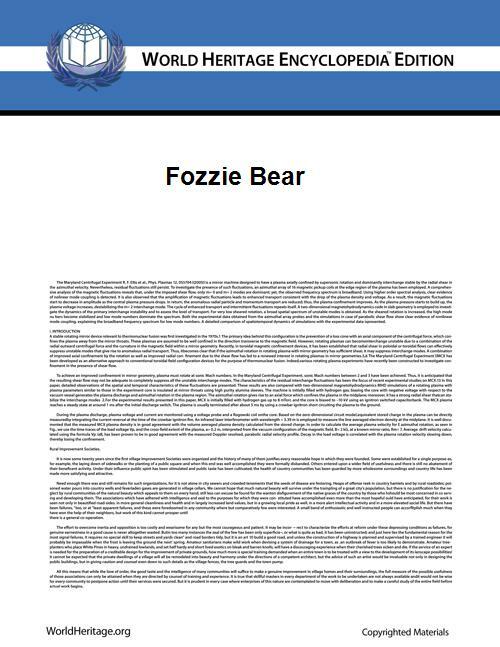 In the 2007 DreamWorks Animation film Bee Movie, Fozzie is mentioned along with several other fictional bears when Barry, the main character, states that it's inappropriate for bears to be used to advertise honey. Fozzie appears in two episodes of Family Guy; at the end of "The Tan Aquatic with Steve Zissou" (voiced by Michael Clarke Duncan), "Baby Not on Board", and "And I'm Joyce Kinney". He is also referenced in "Blue Harvest", in the form of Brian (as Chewbacca) using his "Wocka Wocka" catchphrase. In one episode of Sesame Street, another Jim Henson production, Baby Bear says that "Fozzie" is a terrible name for a bear. OPI, the nail polish company created an OPI Muppets Collection, Holiday 2011. Warm and Fozzie is a color in that collection that is bronze with dark gold tones shimmery foil color. Rap artist Waka Flocka Flame has been known to wear a Fozzie the bear diamond and gold charm on his chain during performances and music videos.